Magneti Marelli, the global automotive systems and components supplier, illustrated the possible “green” technological links between motorsport and “road cars” during the course of a workshop held today in Washington D.C., organized by the Italian Embassy and sponsored by the Italian Ministry for the Environment within the scope of the 2012 edition of Global Cleantech 100 (http://events.cleantech.com/global100/). Aim of the event: to encourage the meeting between Italian companies active in the “green economy” and American investors. An unusual combination until recently, high performances and eco-sustainability today are travelling on increasingly converging paths, driven by the growing need to reduce costs, fuel consumption and emissions, making the “bridge” between the motorsport world and the “road cars” world even more strategic, in a technological osmosis capable of adding value to both areas. In this sense, Motorsport, an area in which the company has been operating since its founding in 1919, represents for Magneti Marelli a fertile environment, a technological laboratory and an incubator for the development of new competences and technologies that also feed and inspire new “green” solutions, with a view to “sustainable mobility”. The tangible example of the KERS was illustrated during the workshop. This is a system for the recovery of kinetic energy under braking developed in 2008 for Formula 1, which then became a source of technological solutions and spin-offs for systems and components aimed at mass-produced hybrid and electric engines (motor-generators, electronic control systems, inverters, battery control, etc). 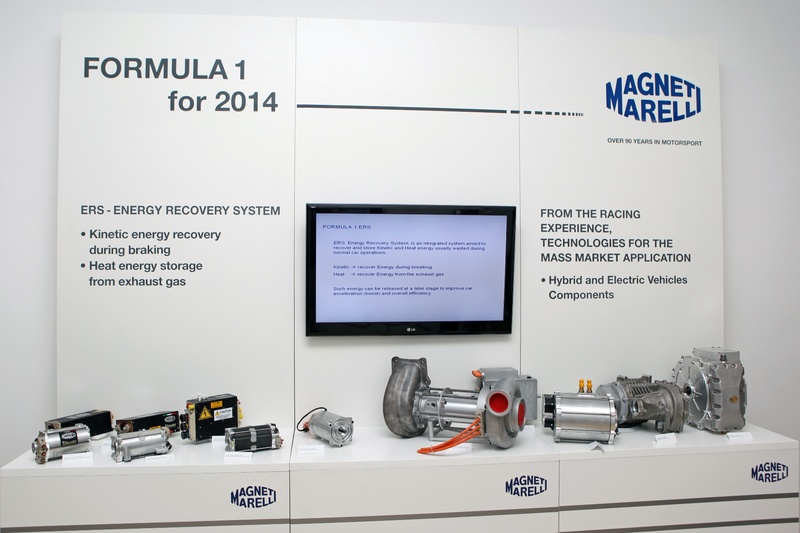 In view of the new F1 regulations set to come into effect in 2014, Magneti Marelli is already working on developing and fine-tuning its evolution: the ERS (Energy Recovery System) system, which combines the recovery of kinetic energy under braking and the recovery of energy coming from exhaust gases, both aimed a feeding the electric motor-generators connected to the drive shaft. Thus new scenarios are opening up to hybrid solutions in motorsport, with important opportunities in terms of engine performance, consumption and efficiency even as regards mass production. An opposite journey – from mass production to competitions – was traveled by the GDI high-pressure injection technology, which has been adopted for some time now on mass-production vehicles in order to achieve high-level performances with a view to reduce consumption/emissions, boost performances and downsize engines: today, it is also used on the racetrack and during rallies and, starting in 2014, it will be fitted on Formula 1 cars. At present, Magneti Marelli Motorsport is already testing injectors and pumps for GDI engines with gasoline pressure values of up to 500 bar. Moreover, Magneti Marelli is already working on developing a two-way WI-FI data transmission system from vehicle to infrastructure (for example: machine-pits) that, compared to the current radio transmission, allows the more effective exchange of a much larger volume of data and various types of signals, at high speed. These technologies, suitably adapted, have important spin-offs in the area of connectivity and infotainment systems for mass-produced automobiles, specifically with regards to communication technologies between one vehicle and the next and between vehicles and central infrastructures, with a view to smart traffic and vehicle management, and to the optimization of itineraries and dynamic driving or “automatic driving” electronic horizon solutions. These three examples of technologies illustrated in Washington D.C. may allow up to a 35% reduction in fuel consumption, performances being equal, in the motorsport area, as well as significantly reduce consumption and emissions on standard vehicles too.